The number listed above, 407-233-3838, is my business cell phone line. I answer it 24/7. However, I appreciate only relevant calls - about nuisance wildlife problems that you'd like me to take care of. If you have a problem with a domestic animal, such as a dog or a cat, please call one of the county animal services numbers listed above. They will not assist with a wild animal issue - they serve as animal control officers that handle barking complaints, dog bite reports, and stuff like that. 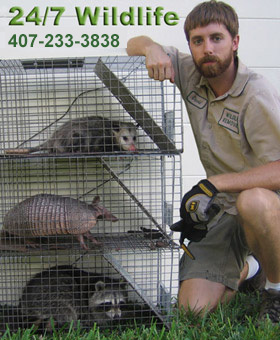 If you're having a problem with an Orlando critter, control it with a professional service. We handle issues such as raccoons in the attic, an armadillo digging under your house, or a snake in your pool, and you have to hire a private nuisance wildlife trapper to take care of these types of problems. I do carry my cell phone with me all the time, but please be aware that I'm often working in attics or on roofs, driving, or handling animals, so I don't have much time to answer frivolous calls from people who merely want advice or information. However, if you're interested in hiring my company to take care of your wildlife removal needs in the greater Orlando area, I'm always happy to accept your phone call at any time. You can email me if you wish as well. If you do not live in the greater Orlando area, please do not call me asking for advice or for a referral. Please click here for a nationwide directory of other wildlife control operators like myself. I do provide bat control work throughout the entire state of Florida, but this is usually the only time I'll travel outside of my central Florida service range. Please see the below list for all of the towns that I cover.